Mindfulness meditation is a traditional Buddhist practice. It is now commonly taught as a practice helpful in the management of a variety of mental health conditions. 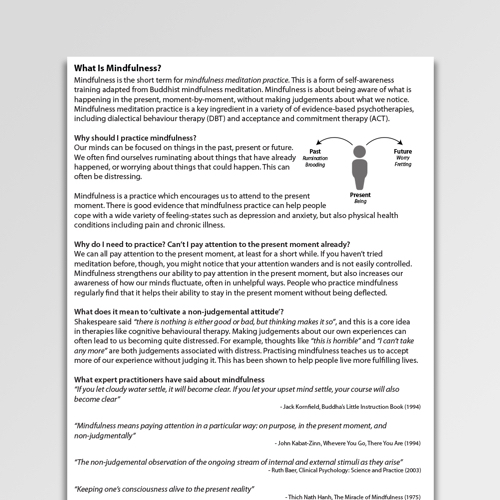 This information handout describes the key principles mindfulness. What Is Mindfulness? 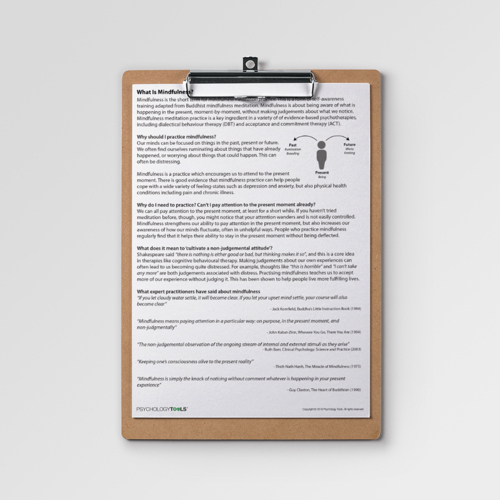 is an information sheet describing the key principles of the practice of mindfulness meditation practice (‘mindfulness’). Mindfulness meditation is a practice that psychologists have borrowed from the Buddhist tradition. Mindfulness exercises can help people to experience themselves differently, and to experience a different relationship to their thoughts. Mindfulness is an important component of therapeutic models such as Dialectical Behavior Therapy (DBT), Mindfulness Based Cognitive Therapy (MBCT), and Acceptance and Commitment Therapy (ACT). Mindfulness has been demonstrated to help a wide variety of conditions including feeling-states such as anxiety and depression, and physical conditions such as chronic pain or illness. 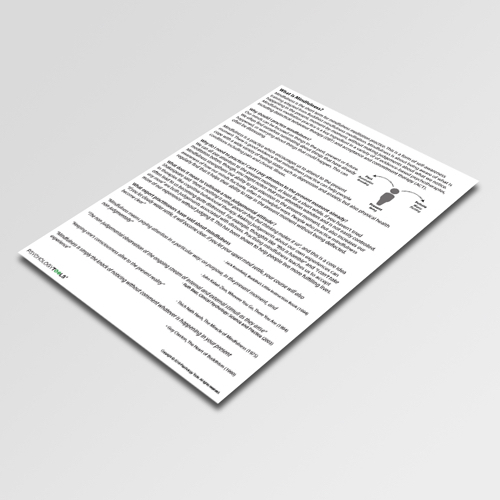 This information sheet contains a simple introduction to mindfuless further illustrated by a number of helpful quotations. van der Velden, A. M., Kuyken, W., Wattar, U., Crane, C., Pallesen, K. J., Dahlgaard, J., … & Piet, J. (2015). A systematic review of mechanisms of change in mindfulness-based cognitive therapy in the treatment of recurrent major depressive disorder. Clinical psychology review, 37, 26-39.